Please be advised that a small portion of the Hidden Creek Trail is closed. Take in some fresh air and the beauty of nature while picnicking in Shark River Park. The Park System's first park, opened in 1961, occupies 988 acres on either side of the Shark River in Neptune and Wall Townships and Tinton Falls. Its waterways, sandy hills, forests and ponds attract anglers and hikers in the summer, and cross country skiers and ice skaters in the winter. 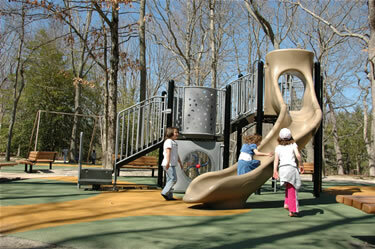 Children can enjoy climbing, swinging and sliding on the playground year round. Area residents can fish for largemouth bass, catfish, sunfish, yellow perch, shiners and black crappie. 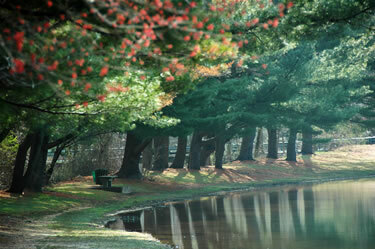 The Shark River, which flows near the pond, is stocked seasonally with trout. A state fishing license is required for anglers over age 16. 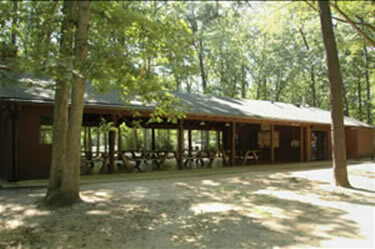 There are also facilities for shuffleboard and horseshoes: equipment may be signed out for free at the Shelter Building. 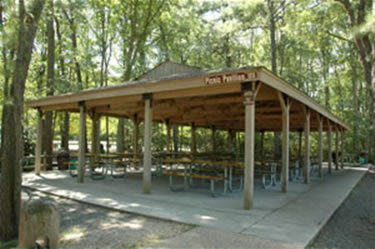 Visitors can also enjoy picnic tables and grills available on a first come, first serve basis. Shark River Park features reservable group picnic areas and is a great spot to host a family reunion, an office get together, or a bunch of friends. State Hwy. 18 to Exit 8 (Rt. 33 west to Schoolhouse Rd.) Turn left onto Schoolhouse Rd. Follow to Park. Garden State Parkway to exit 100 (Hwy. 33 east). Continue on Hwy. 33 to Schoolhouse Rd. Turn right onto Schoolhouse Rd. Follow to Park. State Hwy. 35 to Hwy. 33 west to Schoolhouse Rd. Turn left onto Schoolhouse Rd. Follow to Park.